The following report on Swellendam and Augusta de Mist appeared on today’s Good Taste online magazine and was written by Graham Howe who stayed with us as while back. We asked him to please focus on the town and region as we felt that Augusta de Mist needs to be experienced as part of a bigger itinerary he really did capture that ‘weekend in Swellendam’ with his article. But there are also loads of things to do in Swellendam itself—art galleries, antique shops, pottery studios, handcraft shops and restaurants—as well as botanical gardens and historical walks. Little kids and big kids like us enjoyed visiting the Fairy and Angel Healing sanctuarywhere you can talk to the little people. We spent a rainy day exploring the old blacksmith’s shop, wagonmakers and working watermill at the Old Drostdy Museum. Nearby Bontebok National Park is also well worth visiting, as well as one-day rafting trips on the Breede River. And don’t miss The Old Gaol, a famous country restaurant which serves the best vetkoek and melktert in the Overberg—as well as wonderful cheese cake and bredies—set on historic Church Square. 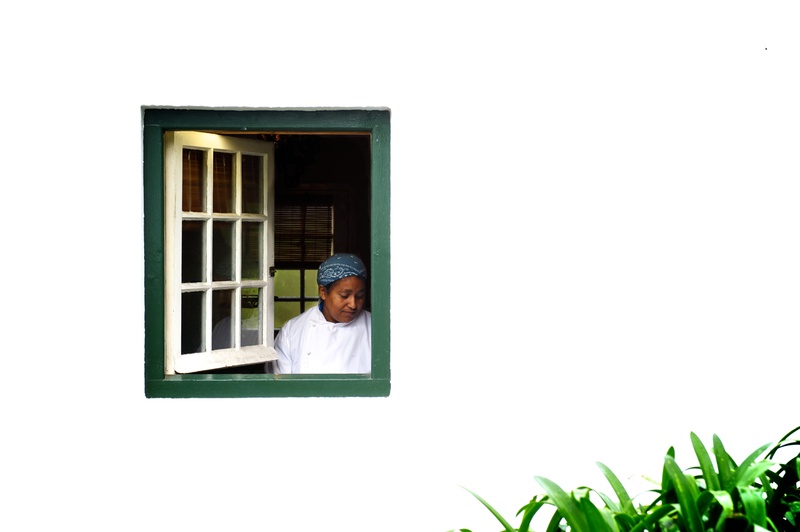 Lena Vergotini, the chef from Janharmsgat farm, now runs this kitchen in the heart of Swellendam. We also loved the authentic Italian fare at la Sosta run by an Italian mom and pop who left Milano to settle in Swellendam. Swellendam has a huge choice of accommodation for every pocket from bed-and-breakfast guesthouses to luxury lodges. We stayed at Augusta de Mist, a collection of self-catering cottages scattered throughout a huge fynbos conservancy. It has real country soul. Guests ring a real bell to announce their arrival and take tea on the stoep of the palm villa with farm dogs. The seven suites are set in gardens with a lavender maze. It’s run with inimitable hospitality by the owners: Henk, a retired opera singer and singing chef who creates five-course dinners with their own house wines at Augusta’s African Kitchen. And Michel, who publishes The Augusta Daily for breakfast reading. Henk’s malva pudding recipe is world-famous—he tells me a review even made the New York Times. Graham Howe is a freelance travel writer based in Cape Town who specializes in gourmet tourism. He is wine and food editor of Habitat—and a contributor to Business Day’s Homefront, Eat Out,www.iol.co.za and www.wine.co.za.